Well, its been on my shelf for almost a year, and I finally got to it. 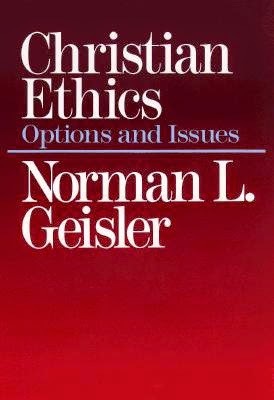 Christian Ethics: Options and Issues by Norman Geisler is quite a read. Like Giesler's other books that I've read, this one is divided and outlined very clearly. It is easy to follow, but has lots of stimulating content. It is broken into two different parts with 310 pages. In Chapter 1 Geisler introduces the philosophical topic of ethics. He quickly summarizes ten different proposed foundations for ethics (including power, pleasure, human survival, and God's will). He then examines five unique attributes of Christian ethics and concludes by providing examples (using lying) of the different views of ethics. Chapter 2 begins Geisler's more detailed examination of the different views of ethics. He provides a history of the antinomian view; he covers the time from the ancient beginnings to contemporary influences. In the process he looks at twelve different ethical philosophies that fall under the broad umbrella of antinomianism. He points out what they have in common and provides what he believes are the good influences of antinomianism, including the fact that it stresses individual responsibility. He then offers a critique of each individual system, then provides the issues with antinomianism in general- the major ones would be that it is self-defeating, and it is too subjective to be of value to the whole of humanity. Chapter 3 deals with Joseph Fletcher's Situationism. Geisler begins this examination by explaining that the purpose of this ethical model was to avoid the pitfalls of legalism and antinomianism. He describes the "single-norm" ethic that is put forth by Fletcher. Basically the ethical thing to do in any situation is determined by the single absolute norm: love. Geisler states that Situationism does have its advantages over legalism (it is sensitive to circumstances, it stresses love over other possible norms, and others) and antinomianism (it does have an absolute and is a normative position). However, he does point out that the "love" does not really have a foundation- it is determined by the situation. The fact that the "absolute" is actually relative makes it a form of the antinomian view. He also points out that the end result of a decision is that the most love be accomplished- a form of utilitarianism (the subject of Chapter 4). In Chapter 4 Geisler discusses what is more commonly called utilitarianism. The general idea of this ethical model is that any behavior may be justified if it will achieve the most good for the most people. Popularly, it is summed up as "the ends justify the means". Geisler points out that there are a few different positions within this view that distinguishes what "good" means (if it is based on quality or quantity) and how exceptions are handled. He mentions that in general utilitarianism does affirm the need for a norm or standard and provides a way to deal with conflicting norms. However, he does state that its weakness falls in the need for "good" to have an objective standard (a norm of its own) and the fact that the "end" is ambiguous (due to lack of omniscience of humans). The responsibility to determine both of these then falls back on the individual making the decision. The individual would then need to appeal to another ethical system of his choice, which ultimately defeats the need for this one and leads back to the first system described: antinomianism. Chapter 5 begins looking at the alternatives to the relativistic systems discussed in the previous chapters. The first (unqualified absolutism) holds that all ethical rules are absolute and should not be broken for any reason (hence "unqualified"). According to this view, there is no true ethical dilemmas- there is either a third way out or the dilemma was caused by some sin in the person's life, and they must live with the consequences of either sin committed. Geisler describes three forms of unqualified absolutism from St. Augustine, Immanuel Kant, and John Murray. Like with the other systems, he offers pros and cons. Pros would be that it offers an absolute ethic and relies on God's nature and providence for identifying morals and dealing with dilemmas. Geisler then looks at how many adherents must appeal to God's providence to resolve dilemmas and points out that that appeal is in fact a qualification. He ends the chapter noting that we do live in a world full of sin, and that moral dilemmas are real, and people are faced with them all the time. In Chapter 6 Geisler looks at the second option for the absolutist. Conflicting Absolutism, like Unqualified Absolutism, affirms that there are absolute moral duties. However, it recognizes that genuine conflicts do exist, and that they cannot be avoided. He explains that when such a conflict arises, the duty is to choose the "less evil". Unfortunately, even though there was really was no option to not commit a sin, the person will still be held accountable for sinning. Geisler points out that many of the good things about Unqualified Absolutism follow into Conflicting Absolutism. However, he did mention a couple negatives. Geisler points out that the duty to do the "lesser sin" is actually a duty to sin. He shows how an ethical dilemma would turn the duty "to do the right thing" into the duty to do "the wrong thing" (since there is no alternative). But, Geisler's main argument against Conflicting Absolutism is that if this is true then it follows that any time Jesus had an ethic dilemma, He sinned. However Scripture states that Jesus never sinned. Because of this, Geisler holds that Conflicting Absolutism is not a viable option for the Christian. After providing several ethical options and critiquing them, Geisler finally offers the system that he believes resolves the issues of all the others: Graded Absolutism. Simply, this system has many ethical duties that are absolute. When they come into conflict, a scale is used to determine which option to go with. No duties are not considered "more absolute" than others, they are considered more binding. This system is absolute on three levels: the duties are absolute by being grounded in God's nature; each duty is absolute within its context; and the levels are absolute being grounded in God's nature. We are held responsible to correctly identify the more binding duty in a conflict, and we will not be held responsible for being stuck with the less binding duty. Geisler spends several pages responding to challenges that this system is actually one of the others already described. He concludes by giving some of the values of Graded Absolutism, including that he believes that it is the only system that can make sense of the Cross. Having established the system of ethics that he will be using, Geisler now moves on to Part 2, where he looks at specific ethical challenges. The space provided to discuss the different ethical issues is limited, so his treatment is not thorough or as technical as some may like. However, this section will introduce the reader to the complexity of the issues, address the issues, and prepare the reader for more in-depth material. In all the following chapters, Geisler distinguishes among specific positions and lays out the debate clearly. The following chapter reviews will be shorter than in Part 1. Geisler begins his investigation of abortion by pointing out that the whole debate centers on the humanity of the fetus. From this he establishes that there are three different positions on abortion: Abortion anytime, abortion sometimes, and no abortions at all. He lays out the biblical, scientific, philosophical, and emotional arguments for each position, then offers critique for the first two options and answers objections to the third (the one he holds). Geisler's treatment of euthanasia follows the same pattern as his chapter on abortion. He points out that euthanasia can fall into several categories: active or passive; voluntary or involuntary; and self-causes or caused by someone else. He provides the arguments for each and critiques the views opposed to his. He then gives a defense for his own view. In chapter 10 Geisler attempts to cover a host of biomedical issues at the same time by looking at the foundations of the different views. He establishes what the humanistic view entails: man is responsible for human value, individuals have sovereignty over life, the duty to create a superior race, and the ends justify the means. He evaluates these foundations then provides the Christian alternatives: God is responsible for human value, God is sovereign over life, there is no duty to create a "superior" race, and the ends do not always justify the means. Chapter 11 covers three different views on the issue of capital punishment: rehabilitationism (no capital punishment at all), reconstructionism (capital punishment for all crimes originally punished this way in Scripture), and retributionism (limited capital punishment). He provides the philosophical, social, and biblical arguments for each position, then provides a critique of each one. Chapter 12 tackles the ethics of war. Geisler presents the two extremes: Activism and Pacifism. Activism being the view that one should engage in all wars commanded by his government. Pacifism being the view that no war should ever be engaged in. Geisler presents the biblical and philosophical arguments for each view then analyzes them. He puts forth the strengths and weaknesses of each view and show where each view is right. He then provides a balanced view: Selectivism. This view holds that some wars are just but not all. He provides the arguments for it then offers the its weaknesses. Related to the ethical question of war is the justification of civil disobedience. Geisler begins this chapter by explaining that the ethical rightness or wrongness of the American Revolution is at stake with this question. As with the other ethical issues, he provides both sides from the secular and biblical perspectives. He provides counter-points and shows the strengths and weaknesses of each view. He takes the reader through the logical struggle and eventually gives his view on the American Revolution. Along side abortion the issue of homosexuality is one of the most heated and debated ethical issues today. In Chapter 14 Geisler looks at it from both sides. He provides arguments for and against homosexuality being ethical from both a biblical and secular perspective. He offers counter-arguments for both sides (sometimes in the context of the argument for the other side; others are more direct and explicit). He takes the position that homosexuality is ethically wrong. However, he ends the chapter discussing how Christians should approach the topic and people who are homosexual. He is adamant that the debate be focused on the behavior rather than the individual. In this chapter Geisler looks at marriage, divorce, and remarriage. He describes the Christian view of marriage, then goes into the differing views on divorce and remarriage. The three views that he evaluates are: divorce in never permissible, divorce is permissible only in the case of adultery, and divorce is permissible for multiple reasons. He looks at the merits of each view and the arguments for each position. He offers his critique of them and provides a conclusion that takes the biblically sound portions of each and combines it into one coherent view. In the final chapter of Christian Ethics Geisler tackles the proper treatment of the environment. Geisler describes two extreme positions: materialism and pantheism. The former sees man as dominator of nature and can exploit it however seen fit. The latter sees man as a part of and servant to nature, thus no benefit may be derived from nature at the cost of nature. Geisler points out the value of each position, although he is more critical of the materialistic position. He describes the Christian view as being between the two and having its foundation in the doctrine of creation. He concludes that Christians are to be good stewards of the environment, while using its resources. Christians must be careful to not overuse the resources because it is the home that God created for and entrusted to him. Christian Ethics was quite an interesting and enjoyable read. It helps the reader to think more clearly about the different ethical systems proposed by Christians. He guides the Christian though a thoughtful evaluation of several ethical debates and provides conclusions that are soundly based on scripture. This book is recommended as an introductory book for Christian Ethics; so, those interested in particular systems or specific debates should not rely solely on this resource. Geisler wrote this book with the beginner in mind and takes care to clearly articulate difficult concepts. His inclusion of a glossary also helps with those not as familiar with the more technical terms. The only criticisms that this reviewer wishes to offer is that a few of the arguments and counter-arguments from Part 2 seemed awfully weak and unpersuasive; however, those did not tip the scales against Geisler's overall cumulative case against or for certain conclusions. The lack of a summarizing chapter at the end also leaves the reader without the sense of a "wrap up" of the content of the book. Overall it is well-written and a highly recommended read.